This page is dedicated to informing the public about our efforts to continue the fight to stop the Southside Project, and how people can get involved. On Tuesday, Feb. 19th, Nantahala District Ranger Mike Wilkins gave final approval for the controversial Southside Project to proceed. The Chattooga Conservancy has just issued a press release regarding this development and our position. Thank you to all who have joined in the fight against this ill-conceived project, and all who continue to spread the word and voice their opposition through social media, writing letters, and making calls. Stay tuned for next steps. In early February, we received a letter from Forest Supervisor Allen Nicholas in response to objections to the Southside Project, which were also discussed at the Objection Resolution meeting in November. The letter concludes with the Forest Supervisor’s instructions for the District Ranger prior to his signing of the Decision Notice. The instructions are very minimal, and essentially recommend that the project move forward as planned. Put simply, we do not agree that Mr. Nicholas’s responses sufficiently address the issues raised, but rather, they generally evade the points of our arguments altogether. We anticipate the Decision Notice will be signed within the next week, and do not expect it to be in our favor or waver from the objection response letter. Once the Decision Notice is signed, we will be able to make a decision regarding our next steps. The Chattooga Conservancy attended an Objection Resolution meeting with the US Forest Service and other objectors on Thursday, November 1, 2018. Approximately 20 named objectors and representatives were present at the meeting, as well as approximately 10-15 additional members of the public. During the course of the four-hour meeting, named objectors were invited to speak directly with the USFS, including Forest Supervisor Allen Nicholas and District Ranger Michael Wilkins, about their objections to the project. Many compelling points were brought up and discussed regarding the project’s potential impacts to old growth, wilderness inventory areas, Natural Heritage Natural Areas, green salamander habitat, water quality, and soil erosion, as well as the project’s use of herbicides and prescribed burning. 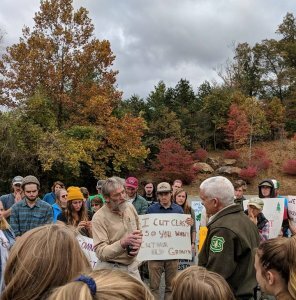 Following the meeting, a protest rally organized by the Chattooga Conservancy began in the parking lot, so that members of the public who were not allowed to speak during the meeting could make their voices heard. Approximately 80 people attended the rally to stand up for these precious forest lands! Mr. Nicholas and Mr. Wilkins met with the protesters outside to listen to concerns and discuss the project. The conversation, though passionate and at times contentious, remained peaceful. Local news station WLOS attended a portion of the meeting and rally, and aired the story that evening. The Forest Service will now consider the objections before making a final decision. We do not have an estimate for when the decision will be made, but will update as soon as there is any news. Thanks to everyone who has participated in this fight thus far! We greatly appreciate all who have attended informational meetings, followed the objection process, shared the issue with friends and family, and shown up!! The U.S. Forest Service has scheduled a meeting for November 1st to discuss objection issues regarding the Southside Project with “named objectors” (those whose objections met the objection filing requirements). Named objectors have been individually notified and invited to the meeting. On 11 July 2018, the Nantahala Ranger District of the U. S. Forest Service in North Carolina issued their “Draft Decisional Environmental Assessment” for the Southside Project. This document showed that the agency wants to move full steam ahead with this controversial project. Comments objecting to the Southside Project were due by Monday, August 27, 2018. The Chattooga Conservancy’s Sample Letter written to help craft comments is available to VIEW or DOWNLOAD. Cutting 317 acres of timber: 196 acres of “2-age” harvests, and 121 acres of “group selection” harvests. Burning 37 acres, in combination with a separate but connected proposal to burn 722 acres at Bull Pen and 956 acres at the eastern portion of the project area around Jacks Creek. Nearly 60% of the stands of timber offered for harvesting in the Southside Project are over 100 years old, and are prime candidates for old-growth restoration. At least two stands of timber are existing old growth, with trees near or over 200 years in age. The Southside Project is located in the Chattooga River headwaters in North Carolina, and is a 28,000-acre area stretching from the Whitewater River, over Chattooga Ridge to the Chattooga River headwaters of Jacks Creek, then over the East Fork of the Chattooga River just north of the SC/NC state line on Highway 107, then along the Bull Pen Road, just north of the Ellicott Rock Wilderness Area in the Terrapin Mountain Potential Wilderness Area, then across the Chattooga National Wild & Scenic River Corridor along the Bull Pen Road adjacent to the Ellicott Rock Wilderness Extension and the Slick Rock Scenic Area, and finally, across to an area near “Granite City” at the foot of Black Rock Mountain, adjacent to the Black Rock Natural Heritage Area on the outskirts of Highlands, NC. 18,000 acres in this “Analysis Area,”where the forest management activities are proposed, are lands managed by the Forest Service, that are contiguous with 10,000 acres of private lands, which will also be affected by these activities. This area encompasses one of the highest concentrations of wilderness, sections of National Wild & Scenic River Corridor, potential wilderness, unique backcountry, and designated scenic and biologically protected areas in the Southern Appalachian Mountains. In March 2017, the Nantahala Ranger District issued a “scoping notice” for the Southside Project. The Forest Service admits that a large number of citizens responded with comments in opposition to the proposed project. Then about a year later, on February 16,, 2018, the Nantahala Ranger District published a “Draft Environmental Assessment” for the Southside Project, and asked for public comments (as required by the National Environmental Policy Act [NEPA]). The Forest Service proposed to conduct management activities within a large area of public lands in the Chattooga headwaters, as described above. They claim the purpose and need for this activity is “… to improve, or maintain, wildlife habitat, species diversity of stands, soil and water resources, and forest health through vegetation management and other treatments.” The “treatments” the Forest Service is proposing call for “2-age” timber harvesting (a modified form of clearcutting) on the majority of stands proposed for cutting; “group selection” timber harvesting; herbicide treatments on hundreds of acres to cultivate “crop trees;” and, controlled burning. The proposal also includes building roads and skid trails for logging. The Nantahala Ranger District claims that there is a need to create “early successional habitat,” to restore forests to a more native condition. Nearly 60% of the stands of timber offered for harvesting in the Southside Project are over 100 years old, and are prime candidates for old-growth restoration. At least 2 stands of timber are near or over 200 years in age. Old growth stands are extremely rare – only .5% (one-half of one percent) of these rare native forests remain in the southeastern US, and they should not be destroyed. Old growth stands serve as examples of native forest that can be studied as blue prints for restoration, and as critical habitat for many species of plants and animals. Old growth forests, when connected across the landscape, could provide our best chance to adapt and mitigate the effects of climate change. Also, what the Forest Service has failed to acknowledge is that old growth forests will naturally provide needed early successional habitat as the trees mature, die and fall, which creates canopy gaps allowing additional sunlight to stimulate new growth. Old growth forests are true native forests that somehow escaped the slash and burning that occurred in the watershed at the turn of the 20th century, during the timber boom years when almost all of our native forests were destroyed. Remnant patches of old growth should be protected as a top priority of conservation biology. We feel very strongly that cutting the last remaining old growth forest in one of the most biologically rich ecosystems on the planet, using the same slash and burn methods that destroyed the vast majority of our original “native” forests, is heresy! Consequently, we are spearheading an effort to get the Forest Service to withdraw the Southside Project. We have held public meetings, and worked with University of North Carolina students to document old growth using the latest scientific methods and Forest Service criteria. We have also filed extensive comments, and rallied the public to get involved. Over 200 people commented on the Southside Project proposal during the most recent 30 day comment period, many of whom agreed with the Chattooga Conservancy and requested that the project be withdrawn. 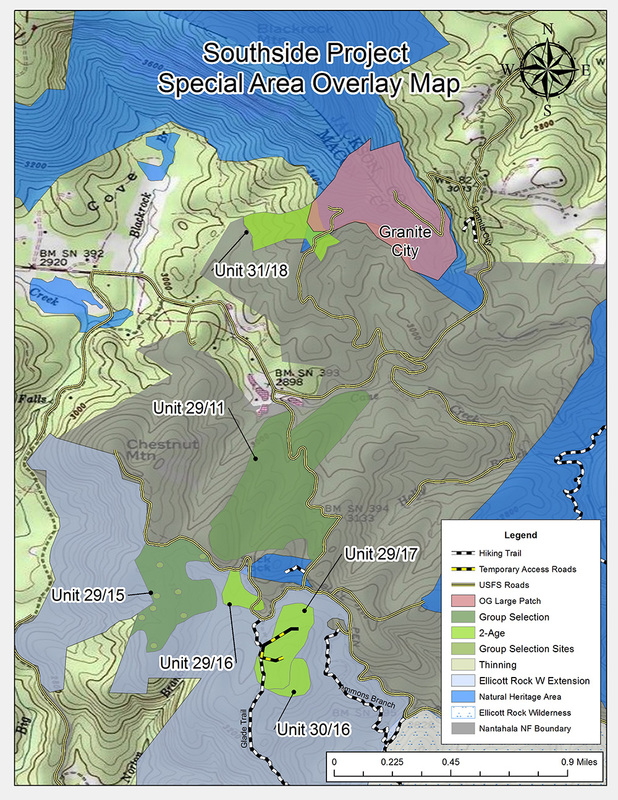 But on July 11th, District Ranger Mike Wilkins announced that he would be moving ahead with the project in spite of extensive, science-based objections filed by the Chattooga Conservancy and other NGOs, and an overwhelming public response to shelve the project. Now that Ranger Wilkins has decided to move ahead with his chosen alternative outlined in the Draft Decisional Environmental Assessment (EA) that cuts old growth stands and maximizes “crop tree” management, those who commented during the scoping period are eligible to object in writing during a 45 day “objection period.” The Chattooga Conservancy and several other conservation organizations have written Freedom of Information Request to obtain any new information from the Forest Service that will help with our written objection. We have a little time, since the objection period deadline is August 27th. The best thing people can do to stay involved with this action is to keep checking this site. Our goal is to generate input to the Forest Service through an informed public. We will provide the information we discover in the coming days, and post it here so folks who have “standing” (those who made comments during the earlier comment period in March) can use it in a written objection. For those new to this fight, we will also push for a public meeting, and will inform people about places and times if we are successful. And finally, we are working on legal opposition, if we do not get the Forest Service to seek another alternative during the objection period. Please stay involved to help us stop the Southside Project. Also, consider joining the Chattooga Conservancy, so you can be added to our contact list.